Musa Kart speaks to the press before his arrest in October 2016. 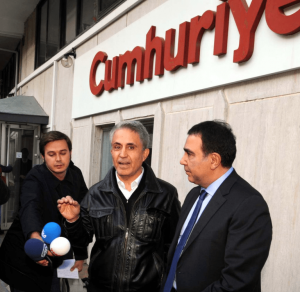 Turkish cartoonist Musa Kart and several of his colleagues from Cumhuriyet newspaper have now spent over six months in prison, joining about 130 other journalists similarly detained in the media crackdown following Turkey’s attempted coup last July. In advance of the NATO summit in Brussels this week, Cartoonists Rights Network International sent an open letter to President Recep Tayyip Erdoğan and European leaders advocating for justice on the imprisoned journalists’ behalf. Kart and his colleagues were held for five months before they were finally charged with supporting Kurdish militants and the Gulenist movement last month. The charges specifically against Kart are “helping an armed terrorist organization while not being a member” and “abusing trust.” Organizations that advocate for press freedom, including the International Press Institute and the Committee to Protect Journalists, say that the charges are baseless and simply provide cover for Erdoğan to silence accurate coverage of his regime. Furthermore we reject the charges leveled against Kart and his colleagues, who have done nothing more than pursue careers in journalism. Read the full letter from CRNI President Joel Pett here.